We’d love your help. 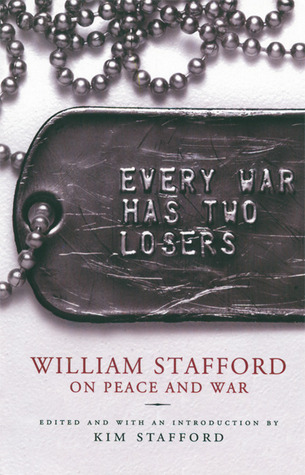 Let us know what’s wrong with this preview of Every War Has Two Losers by William Stafford. Born the year World War I began, acclaimed poet William Stafford (1914-1993) spent World War II in a camp for conscientious objectors. Throughout a century of conflict he remained convinced that wars simply don’t work. In his writings, Stafford showed it is possible—and crucial—to think independently when fanatics act, and to speak for reconciliation when nations take side Born the year World War I began, acclaimed poet William Stafford (1914-1993) spent World War II in a camp for conscientious objectors. Throughout a century of conflict he remained convinced that wars simply don’t work. In his writings, Stafford showed it is possible—and crucial—to think independently when fanatics act, and to speak for reconciliation when nations take sides. He believed it was a failure of imagination to only see two options: to fight or to run away. To ask other readers questions about Every War Has Two Losers, please sign up. Non-fiction. Poetry, interviews, and essays on pacifism. William Stafford was a conscientious objector during WWII and spent four years in government labor camps putting out fires, building roads and trails, and training for post-war relief work. He was a poet, a professor, and a speaker for peace. This book includes a chapter from Down in My Heart, a memoir he wrote while in the CO camps; "The Mob Scene at McNeil" describes how he and a few of his CO buddies nearly got lynched by the fine citiz Non-fiction. Poetry, interviews, and essays on pacifism. William Stafford was a conscientious objector during WWII and spent four years in government labor camps putting out fires, building roads and trails, and training for post-war relief work. He was a poet, a professor, and a speaker for peace. This book includes a chapter from Down in My Heart, a memoir he wrote while in the CO camps; "The Mob Scene at McNeil" describes how he and a few of his CO buddies nearly got lynched by the fine citizens of Arkansas, simply for being known as conscientious objectors. This is followed by selections from his daily writings. Stafford is a plain spoken and thoughtful writer, but after twenty pages the two-sentence entries about war and humanity start to feel a little trite. The middle section includes poetry that, again, focuses on war and peace. I appreciate Stafford's poetry for its simplicity, and I have several favorites of his, but for the most part, I found these poems hard to crawl around in. I did find a few new ones to enjoy: Explaining the Big One; Watching The Jet Planes Dive; 1940; The Star in the Hills; For the Oregon House Session, 13 April 1987; A Gesture Toward an Unfound Renaissance -- along with an old favorite At The Bomb Testing Site -- that lizard's elbows get me every time. The last section of this book has interviews, notes, and letters, and this is where you finally get a good sense of the man behind all this writing. The interviews were my favorite part of this book, the places where he's engaged in a dialogue, answering questions rather than simply posing rhetorical ones -- a staple of his daily thoughts, essays, and lecture notes. In the interviews, his quiet humor shines through, his ability to connect with an audience, to express his views directly, rather than the indirect rhetorical form. I felt much more engaged by him as a speaker than as a writer, and I think I might like to read more interviews with him. I was searching for some volume of Wm Stafford poems, to get me back to a more raw form of poetry I had been writing during my undergrad years at U-of-M.
Back in the 1980s, in a Stephen Dunning co-lead anthropology class n(the writing section) I was chaffing under his arbitrary rules, such as: use of english words of germanic etymology AND POINTS OFF ("deducted" would have red ink all over it) for french derivative words. Next term I signed up for a poetry writing class (creative writing classes I was searching for some volume of Wm Stafford poems, to get me back to a more raw form of poetry I had been writing during my undergrad years at U-of-M.
Next term I signed up for a poetry writing class (creative writing classes were my "out-breath"); Dunn's section was the only one that fit my schedule of required classes. Dunn's class was a practice of stripping down to the heart of a poem and learning to read one's poems. This was good work. One week a friend and fellow poet, William Stafford, joined Dunn's class and a few students were invited to Dunn's home for two evenings of reading and critiquing. I am as fortunate today as I was then to have been invited. This book, collected and edited posthumously by the author’s son Kim, is a strong and straightforward demonstration of William Stafford’s commitment to peace, reconciliation, justice, and a strong defense of his pacifist behavior during World War II and afterward . In its contents, the book (like much of Stafford’s literary work ) is a combination of various materials with a thematic organization. The book, after beginning with a well-known poem “These Mornings” and an introduction by Staf This book, collected and edited posthumously by the author’s son Kim, is a strong and straightforward demonstration of William Stafford’s commitment to peace, reconciliation, justice, and a strong defense of his pacifist behavior during World War II and afterward . In its contents, the book (like much of Stafford’s literary work ) is a combination of various materials with a thematic organization. The book, after beginning with a well-known poem “These Mornings” and an introduction by Stafford’s son, contains four unequal chunks in its main body. The first chunk is a chapter from his book Down In My Heart that deals with a time the author nearly died in a lynch mob (speaking from experience, that is not enjoyable), the second a collection of random but chronologically organized thoughts relating to war and politics called “Citizen Here On Earth,” selected from Stafford’s daily writings, the third a large body of poetry called “A Ritual To Read To Each Other” that has probably also been published elsewhere (though I had not read the collection in toto before), followed by some questions about victory notes, statements, and interviews on pacifism, followed by some thoughtful notes to some poems and a short biographical sketch of the author. On the one hand, as a conscientious objector who has a rather ironic history when it comes to military matters myself , this is a book that I appreciate for its principled stance on seeking reconciliation (even though it is difficult) and seeking to avoid entanglement in the violence and injustice that fill our world. Likewise, there is much to admire in the distance that Stafford consistently sought in his life from the jingoist feelings of the crowd as well as from the corruptions of power and authority in the United States and every other nation on the face of this earth. He considered himself a citizen of the world, in a way that is fashionable among leftists who are not particularly patriotic to their own nations, but if he had been a more religious sort of man he would likely have considered himself first a citizen of the Kingdom of Heaven and devoted to the ways of God, speaking truth to power here on earth. The pacifism of the author and my own is not so different, although it springs from very different premises, and therefore there is much in this book that is worthy of appreciation, including the author’s insistence on subjecting everything, including ourselves, to intense scrutiny but also giving everyone a great deal of understanding and compassion. That said, there is a side to this book, and to the thinking of Stafford as it is shown in these pages, that is far from praiseworthy and is in some ways contradictory to the ideals professed by the poet and thinker. The contradictions of this work are deep. For one, the author professes a great passion for peace and justice, but has little apparent loyalty to the ways of God that lead to both peace and justice, believing in some sort of vague humanitarian spirit that is cut off from those ways that serve to reconcile mankind with God and with other beings created in His image, even as the author proclaims devotion to Christ, as well as Ghandi and others. Additionally, the author shows a great deal of disdain for militarism as well as big government (which he rightly considers a constant threat to tyranny) but at the same time comments frequently on his total hostility to Republicans, even to the point where he apparently did not know a single person who voted for Reagan in 1980 or 1984, which means that he needed to get out of the left-wing ivory tower and meet some real people. This doublespeak when it comes to politics is, lamentably, all too common on the left. It is one thing to claim that one desires peace and justice and that the politics and ways of this world are greatly corrupt. It is one thing to claim to desire the participation of a wide population of the people and to seek eloquently for minority rights. However, those sort of noble claims evaporate quickly when one engages in blatant partisanship and has little understanding of the range of opinions that exists, or that a man who claims not to have enemies and to see the good even in his adversaries ought not to be a strident and narrow partisan whose work is full of cutting comments that do not cut remotely close to evenly. The fact that this work is published by a Progressive (read: leftist) press only adds to the layers of contradiction inherent in a work, that those who seek the largest and most oppressive and unjust governments possible consistently seek to appeal to a rhetoric of freedom and justice and peace. So, there are elements of this book that are likely to complicate any just appraisal of the thinking and behavior of Stafford given his own tension between a desire to be fair and just and a largely unadmitted and unexamined partisan bias that prevented him from behaving in the peaceful manner that he claimed as an ideal. Of course, we all struggle to live up to our ideals, and so it is best to appreciate what is good and noble and beautiful about this work, and to give the same sort of graciousness to the author’s errors that we would seek for our own. into the canyon channel of air. and hurries it into nothing. and what is left is going into the earth. And part of that city goes into the earth. And part of them goes into the earth. William Stafford, poet and pacifist, has here constructed a book of subtle criticism of war in all its forms, personal and national. Stafford's art and pacifism intertwined, each supporting the other in a grand staircase of personal involvement in opposition to war and eloquent poetry. The interviews, notes, and poems given here show his lifelong struggle, beginning with his four years in a work camp for conscientious objectors n WWII. "And that is what happens to people when a cit William Stafford, poet and pacifist, has here constructed a book of subtle criticism of war in all its forms, personal and national. Beautiful, and very sad too. "My country is No Man's Land." "Most problems I solve by going away." "War prunes the trees, taking the best branches." William Stafford's works are so voluminous that one could actually miss the depth of his committment to pacifism. So, this book provides the focus on his poetry and journal entries and his life in regard to pacifism. It is all very inspiring. Staffor was actually a conscientious objector during World War II--a very unpopular time to be a pacificst. In fact he and fellow c.o.s were very nearly lynched as enemies and spies when they visited a small town in Arkansas that was near where they were as William Stafford's works are so voluminous that one could actually miss the depth of his committment to pacifism. So, this book provides the focus on his poetry and journal entries and his life in regard to pacifism. It is all very inspiring. Staffor was actually a conscientious objector during World War II--a very unpopular time to be a pacificst. In fact he and fellow c.o.s were very nearly lynched as enemies and spies when they visited a small town in Arkansas that was near where they were assigned to work. Stafford's gift for standing outside the fray, his insights and his unique use of language make this an important and enjoyable work. "Success may not mean you did right"
"Today in society you need a tendency not to believe"
That latter one was written in 1987--still true, perhaps even more so. I spent a long time with this book because I admire Stafford's thinking, his poetry, and his courage. In the end, though, I have to say it's unfair to isolate one aspect of such a long and productive life. It comes to seem like preaching and I have never liked to be preached at, even when I agree with the sermon. Coupled with Junger's WAR, it is necessary to consider a human need for brutal combat. Are we, have we ever been, evolved enough to not go to WAR? Why do we kill, maim, desecrate? Is it the only way out of our pupa of youth? Do we, as Stafford says, lack the imagination it takes to not go to war? This man articulates the necessity of non-violence. Recently suggested to me at a training on non-violence, Stafford's writing is inspirational to anyone who's actively try to live a non-violent life. This was an interesting find. I was familiar with conscientious objection to war, but not in the context of World War II. This man's stance as a pacifist defined his life and his writing. Lots of good thoughts in here, but the fragmented way the material is presented made it hard to stick with it. William Stafford words need to be heard during this time of Global strife. If only we fought our wars in poetry rather than in blood. William Edgar Stafford was an American poet and pacifist, and the father of poet and essayist Kim Stafford. He and his writings are sometimes identified with the Pacific Northwest. In 1970, he was named Consultant in Poetry to the Library of Congress, a position that is now known as Poet Laureate. In 1975, he was named Poet Laureate of Oregon; his tenure in the position lasted until 1990. In 1980, William Edgar Stafford was an American poet and pacifist, and the father of poet and essayist Kim Stafford. He and his writings are sometimes identified with the Pacific Northwest. In 1970, he was named Consultant in Poetry to the Library of Congress, a position that is now known as Poet Laureate. In 1975, he was named Poet Laureate of Oregon; his tenure in the position lasted until 1990. In 1980, he retired from Lewis & Clark College but continued to travel extensively and give public readings of his poetry. In 1992, he won the Western States Book Award for lifetime achievement in poetry.